"...with a voice of singing declare ye, tell this, utter it even to the end of the earth; say ye, the Lord hath redeemed his servant Jacob" (Isaiah 48:20). Support Israel! 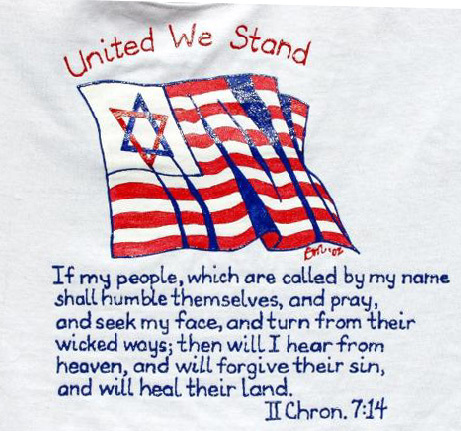 Wear your testimony of love for the Holy Land, spread the Word about Israel's restoration, and the redemption and return of God’s people to the Land! Each T-shirt is a handpainted, one-of-a-kind, signed artwork. There may be slight variations in design and color. All designs are available on white, chambray blue, or black short-sleeve T-shirts of moderate weight 50% cotton/50% polyester, sizes S - XXL. Machine washing in warm/cold water on gentle cycle and tumbling dry warm will prevent shrinkage or damage to the design. Also remove from dryer and hang quickly to prevent shirts from feeling "sticky". This will be only until the shirts cool. They are very durable. I have worn mine for years without any fading, peeling or shrinkage. *Order custom designs for your congregation or organization. Many designs are also available on satin banners (see "Satin Banners" link below). 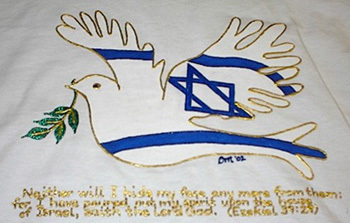 Stunning, handpainted dove over the flag of Israel carrying an olive branch of peace, outlined in glittering silver or satiny gold (shown below on white shirt). Ezekiel 39:29 handpainted beneath design. The proud Stripes of the 13 original American colonies with the Star of the original 12 tribes—United we stand! II Chronicles 7:14 handpainted beneath. $22.50 + shipping. 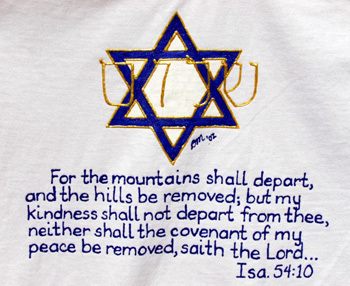 "Shalom" (peace) handpainted over an Israel blue star of David, outlined in gold. Isaiah 54:10 is handpainted beneath. $22.50 + shipping. 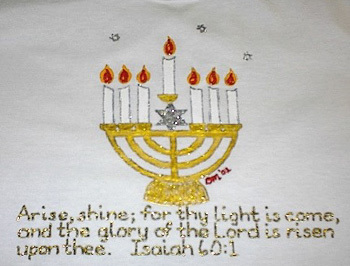 Handpainted star of David with American stars and stripes shining through. 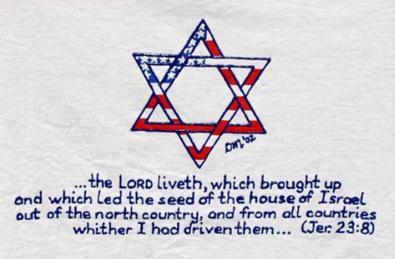 Jeremiah 23:8 handpainted beneath the star, and the last line of the verse is handpainted on the reverse side with “Support Israel” (See reverse below). LOVELY AND UNIQUE GIFTS! 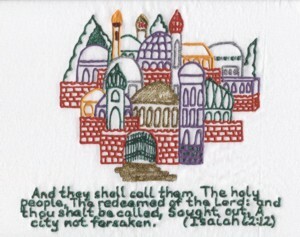 These handcrafted framed plaques may be ordered with your choice of either a Jerusalem blessing or the Testament of Joseph to the twelve tribes of Israel (text of each shown below). 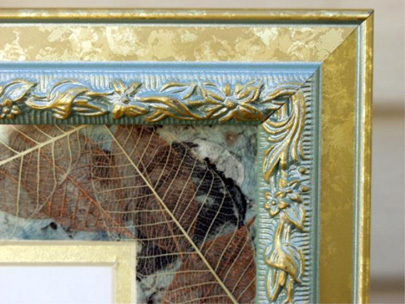 Each is matted with beautiful handmade, handpainted papers and framed in an elegant coordinated frame. 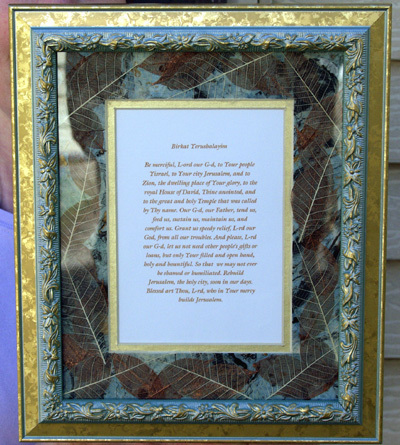 Your choice of text, pictured above matted in shades of aqua, cream, copper and gold, and framed in a beautiful verdi gris (antique gold) frame, 8 x 10 in. To order text choose from "A" or "B" text below. Order Number: A01 $30.00 + shipping. Specify "A" or "B" for text. 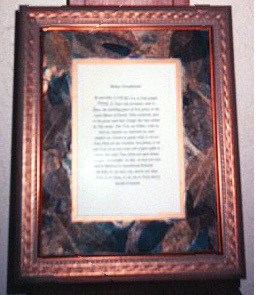 Your choice of text, pictured above matted in shades of teal, burgundy and gold, and framed in an elegant gold frame, 8 x 10 in. To order text choose from "A" or "B" text above. Order Number: A02. $30.00 + shipping. My Giftshop has been visited times.